I bought my 03 M45 a couple months ago and it only came with the valet key, I'm finally getting around to getting a real key for it. The dealership says I have to buy the $525 key and pay $130 for them to program it. I cant find any other options, is there anything cheaper out there that works? I bought a spare (third one for safety) from eBay one time ... still have to get a dealer to program it though. Nothing else is likely to work because of the unusual design. It has to be plugged into the column opening to twist to turn the car on. The valet key.... can you give more info on this? I ask because I'm not aware of a valet version of the key for the Y34. Just the fob and the removable key nested within the fob. Each are the same with no access differences. It is just a standard key with the RFID chip. No buttons on it at all. The locksmith I went to had Infiniti key fobs at his shop. If you can find a locksmith who has the fobs in stock I reckon you could buy it there and get it programmed to the car for much less than the dealer rates. No idea what he charged the tint shop who drove over my key, but I reckon it was much less than the dealer rates. I'm sure it can't be done for $100, but I'm also sure you can get it done for less than $600. whitee01 wrote: It is just a standard key with the RFID chip. No buttons on it at all. Hmmm ... that is not a standard Y34 (2003 M45) key afaik. So, I am a bit confused by what you are describing. Was the ugnition replaced in your car with a non-standard ignition switch or something? 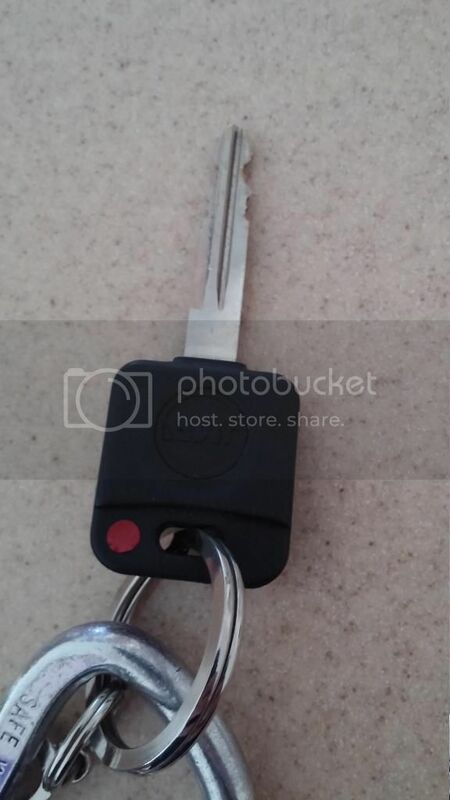 Because, in the 2003 M45 model, the "key" is a plastic fob with a battery, radio transmitter, and the usual four buttons (door lock, door unlock, trunk unlock, red panic button). 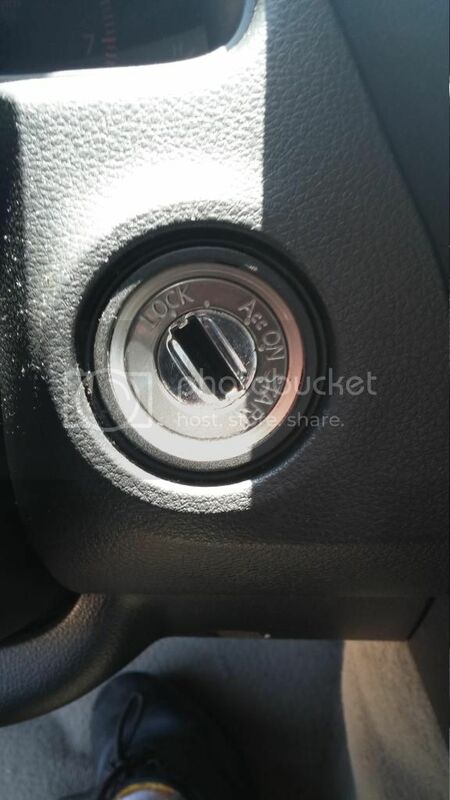 There isn't any metal part - with the typical key teeth for example - that rotates out (like in my Acura fob) to insert in the ignition switch. This is what it looks like: . There is also a diagram of the fob on page 302 of the Users Manual. (see link to the PDF of this in my sig). The entire tip and front of the fob (without any metal "key") is inserted in the ignition switch and turned to start the car. However, what this fob does have is a metal key insert that you can pull out from the top after moving a small spring-loaded switch (in the back of the fob). In the picture above, you see it as a key blank on the right that can be cut to match another key) - this also has the opening for a key-chain. This metal insert is a traditional metal key to get the door and trunk and glove-box open - as far as I know, you cannot start the car with it, since it does not fit in the ignition switch that I know of (I will confirm this tonight when I walk out to my car). BTW, the fob and insert do not have any RFID chips in them, by the way - only the actual plastic fob has the radio transponder. The fob needs a working battery to start the car, afaik. Just confirmed from the Users Manual for the 2003 M45. The car cannot be started with the mechanical metal "key", that is an insert in the key fob. See page 2-16 in the manual (available in our Manuals sections). Double E wrote: The valet key.... can you give more info on this? I ask because I'm not aware of a valet version of the key for the Y34. Just the fob and the removable key nested within the fob. Each are the same with no access differences. There is something called the "wallet" key though (original owners got this - I have mine somewhere!) - this is something you can carry in your wallet for emergencies to unlock your car. However, this "wallet" key cannot be used to start or drive the car either! It can only unlock doors, trunk and glove compartment (the glove-box is not electronic - it requires the mechanical key to unlock. Doors and trunk can, of course, be opened by the electronic fob. By the way, the fob is a radio transmitter, not infra-red. So, you can use it from quite a distance (or even if there are walls in the way). To add to what SZH is saying, the fob has contained with in it, the RFID component. If you open the fob pictured above, you'll see TWO items inside that can be removed. The first is the remote transmitter unit that locks/unlocks doors, panic & opens the trunk. it is further opened with a twist by a coin to reveal the battery. The transmitter case has a gasket on it that should be carefully cleaned when exposed in order to maintain resistance to liquids. The second is the RFID "chip" it is a black polygon piece of plastic about 1/2 inch L x 1/8 inch H x 3/8 inch W, nested in the outer case with some weak adhesive that has probably long since deteriorated in most fobs by now. This chip has coding information on it that only people who work in very dark rooms can understand. This chip is what allows the car to be started regardless of the state of the battery in the first item described above. In fact, it is possible to remove that chip from the fob, take the fob and throw it away, hold the chip close to the keyhole, insert the metal key in the ignition and start the car. I have contemplated epoxying the chip to a discreet place near the ignition and just use the key in the traditional way in effort to reduce the size of the keys I carry. BE WARNED: Losing that chip means you are SOL for starting your car unless you have another fob with a programmed chip in it. A chip can be re-programmed by a dealer (or other person with the right programming equipment; locksmith) but the chip is not able to be purchased separate from a complete fob from the OEM. If you open the fob to replace the battery, be aware that the chip may fall out without notice or warning and given the size, will be immediately lost, rendering the fob useless to do anything but unlock the doors, open the trunk...or appropriately, panic. Sorry about the delay, here are the pictures of my key and ignition. Wow! That key is completely different from what I would expect to see on a US-spec Y34 ... (i.e., 2003 or 2004 M45). The FSM does not describe it like this either. Any other Y34 owner have something like this? Okay, I decided to go see if I could make my car start with just the emergency key (the one that slides out of the back of my fob - key blank shown in my picture above). Because the picture you show of the ignition looks like my car ignition too. The results were both similar and counter to what the manual says (and different from my prior understanding). The emergency key will indeed insert completely into the ignition and allow me to turn it. The the starter motor cranks, but the engine will simply not start up at all - even with many seconds of cranking (I never exceed 20 seconds as a maximum for safety, btw). However, with the fob, the engine starts up essentially instantly. I repeated this multiple times to make sure of the result - with the fob, the engine starts; with the key, the starter cranks but does not start the engine. Interesting indeed! It sounds like someone has programmed the key you have to include whatever chip is needed inside the key to make the engine electronics think that it should start up. At least I hope it is the key that is programmed and not something that has been disabled in the engine management (or security system) computer! This means that an original Y34 fob ought to work - not entirely sure though - when programmed correctly. This one: http://www.ebay.com/itm/INFINITI-M45-Q4 ... f1&vxp=mtr appears to be one you could get - it is not inexpensive though. SZH, that description of operation is correct. The ability to use the key and do what you described is to allow the car to be moved/towed if the battery is dead (would not allow the chip to be read). A backup to being able to shift to neutral and unlock the steering wheel with a dead battery. If the key white pictured works correctly, I'd like to have one. That second e-bay item is not going to work beyond opening up the doors, trunk & panic. The key works perfect, just without a remote. Well then, you might be in luck... remember that post where I mentioned the little chip falling out of the fob? I have a fob with no chip. It came with the car. It's useless to me in starting the car and I do also have 2 working fobs. You'd just need it programmed to your car. If you open up the key head for the key you do have and see the chip, you can buy my fob and put the chip in that. The metal key insert would not fit your car but you already have one that does. How much would you want for it? I'd definitely be interested. I paid $140 for a working one with a chip from an e-bay seller so how about $70 shipped? Double E wrote: SZH, that description of operation is correct. The ability to use the key and do what you described is to allow the car to be moved/towed if the battery is dead (would not allow the chip to be read). A backup to being able to shift to neutral and unlock the steering wheel with a dead battery. "The Infiniti Vehicle Immobilizer System will not allow the engine to start or the ignition switch to be turned without the use of the registered Infiniti electronic ignition key." "The emergency key cannot be used to start the engine, but it can be used to release the steering lock." Double E wrote: That second e-bay item is not going to work beyond opening up the doors, trunk & panic. Bump. Still have a need for my fob? So one of these keys http://www.amazon.com/Ignition-Transpon ... op?ie=UTF8 should work if it has the cip in it, and I bring it to Infiniti or a good locksmith to get it programmed? Dicemoney6 wrote: So one of these keys http://www.amazon.com/Ignition-Transpon ... op?ie=UTF8 should work if it has the cip in it, and I bring it to Infiniti or a good locksmith to get it programmed? I looked into this a while back when I wanted a regular spare. I think my research showed that the y34s used a chip #46 like the one you linked... or was it just #6? Before putting my M on time out, I was planning to check with a locksmith and ask to compare the chip ID for an 03 M45 vs. any other newish Nissan. Plan B was to just buy a key like the one you linked and play dumb when I take it to a locksmith to see if it works. I went to a locksmith today in Decatur, GA and got a metal key like the one I linked to, they used the key that slides in the fob to copy and he programmed it. Cost was $65, he told me any additional key would be $50. So the metal key started the car and I drove home using the copy. It feels funny using a regular key but its way better than paying $500 to $600 which what the dealer told me, then 130 to program the key. I will be getting a remote start over the weekend so I needed this copy. NICE!! This is really good to hear. Even on eBay those integrated oem key fobs usually cost well upwards of 150 bucks. Just to be clear...there IS an alternative to the new key & locksmith programming path. If you use the metal slide in key and hold the fob up close to the ignition, it will start. Meaning that if you pull the chip out of the fob and secure it somewhere very close to the ignition switch, or under the dash at the switch, you (in theory) should be able to use the key only. Granted, the key shape is quite convoluted for regular use in the ignition but if you really want to shed the fob and don't care about remote locks, it's an option. Double E wrote: Just to be clear...there IS an alternative to the new key & locksmith programming path. No, the Valet key will NOT work even if you put the FOB up close to the ignition. You will just piss the starter off if you keep turning. I am interested in the key that whitee01 has though. Hey Dicemoney6, what locksmith did you go to in Decatur? I am interested in a key like yours too since I'll be there soon. Thanks! I have a used FOB for sale. $150 Your key slips into the top, then just get it programmed to your car at a dealer or by a competent locksmith. It took me several years and several cars later, but I also took the leap of faith.